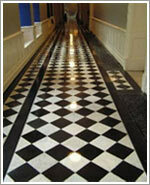 Routine cleaning of marble floors can prevent damage and keep the marble beautiful. Three things the homeowner should know: Prevention, Cleaning without Damage, and Stain Removal.For all commercial or residential properties that have tile floors, tile cleaning is necessary for giving protective treatment to them against possible dirt, debris, bacteria, wear and tear. Posh Floor Ltd renders three things or steps including prevention, cleaning without damage and stain removal to restore lost natural beauty and shine to the tiles. It is said that prevention is better than cure. But, if you fail to prevent yourself then you need to have reliable and result-oriented services of professional and experienced cleaners like us. There is two classes of prevention 1. The daily things that the homeowner can do and Professional services that provide future protection. The homeowner should prevent damaging grit tracked in by foot. Large mats placed at each outside door will collect outside grit and soil. These mats should be shaken or vacuumed frequently. The floor should be vacuumed frequently. Be sure that the vacuum lifts the grit and soil and does not push it around. Prevent contact between staining materials and the floor. Put plastic castors under wood and metal furniture feet. Metals will oxidize (rust) and wood will leach tannins. Put plastic trays under potted plants. The pot itself can stain the floor and dark stains are leached from the plant soil. Do not use rubber pads under rugs; the rubber contains sulfur. Also do not use rough fiber pads; they can scratch marble. Wipe up spills promptly. Moisture will pull stains into the minute crevasses between marble crystals. Acids will dissolve the calcium carbonate in the marble, creating dull, etched spots. Professional applications of stone sealers are effective in preventing stains from penetrating marble. Professional resurfacing of dull, scratched or worn marble will create a hard, smooth finish that resists soiling and stains. A professionally resurfaced floor is also easier to clean because the smooth surface does not have uneven spots that trap dirt. We not only make all sorts of tiles neat and clean with our best efforts and techniques but also make them ready for future protection with a flawless and user-friendly tile cleaning procedure. We clean all tiles ensuring no damage and breakage with the use of right quality cleaners, ingredients and materials. We don’t use any metal-based instrument or apparatus to avoid any scratch to tiles. We know what type of stain is accumulated on the floor and use good quality poultice and stone cleaners to make a particular area look attractive and distinctive. the best results can be obtained by using the right materials before soil accumulates. The best cleaner is a pH neutral cleaner like stone soap formulated for cleaning natural stone. These cleaners contain minerals that can replace minerals stripped by pollution. Stone cleaners are available from Tikkoproducts. They are highly concentrated, and are actually economical to use. Use only tools with plastic and soft fiber parts. Mops and wet vacuums should not have any metal parts; these can scratch marble. Dilute stone soap in a bucket of clean, warm water. Fill another bucket with more clean, warm water. Apply the cleaner with the mop, and then rinse the dirty mop in the second bucket of rinse water. Vacuum up the dirty water or squeeze the mop dry and mop up the dirty water on the floor. Rinse the mop again. Empty both buckets; clean them well and rinse the mop. Refill both buckets with clean, warm water. Apply the rinse water to the floor. Vacuum up the rinse water or squeeze the mop dry and mop up the rinse water on the floor. Do not use green, nylon scrubbing pads; they are harder than the marble and will scratch it. Do not use abrasive cleaners; they will scratch the stone. Do not use thick, creamy cleaners; they will stick in the natural pours of the stone. Soft squeegees, soft sponges and soft, natural cloths are ok.
A stronger solution of stone cleaners can loosen small areas of stubborn dirt. Apply with a sponge and allow the cleaner to penetrate the soil. Wipe up thoroughly and rinse well. first determine whether the stain is water based (wine, etc.) or oil based (salad dressing). Tikkoproducts sell poultices that can usually absorb the stain, until it is virtually undetectable. Follow the directions exactly. Usually the poultice is slightly moistened with a suitable liquid, and then spread over the stain. The poultice is usually covered with plastic wrap so that it remains moist. After the specified time has past, remove the plastic cover and wipe up the poultice. Clean with stone cleaner. If two applications of the poultice do not lighten the stain, it has penetrated the stone too deeply. Consult Poshfloors for resurfacing the stone it can remove some stubborn but shallow stains.